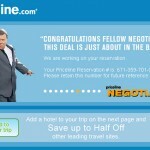 Don’t hold Priceline’s choice of national spokesman against them. William Shatner used to be a really cool dude back in the mid 1960s when he was dashing around the galaxy as original captain of the Starship Enterprise. Despite over-the-top advertising theatrics, a traveler can find really good deals using the service. Here’s the thumbnail sketch. Log onto the Priceline website and navigate to the geographical area you’re interested in. At that point, it’s time to place your bid. You can narrow the choices by star rating you’re willing to accept. Enter how much you’re willing to pay. 30 seconds to a minute later you’ll find out if your offer has been accepted or denied. You can start out really low-balling and might get lucky but count on the fact that you’re probably going to have to make a legitimate offer. Still, you can expect to save 50% – maybe even a bit more – off published rates. On a recent trip to Sarasota, Florida, we suddenly decided the hotel we were staying at was too far from the ocean. We hopped onto the internet and found out there was only one three-star hotel listed in Sarasota on the Priceline website. A little side research revealed it to be the Hyatt Regency. We placed a bid of $55, which was accepted, even though the going nightly rate was around $120. Best $55 ever spent. The moral of this story is don’t ever forget about Priceline when you’re looking for lodging, even if it’s on short notice.